We’re back after a hiatus. I meant to post a couple weeks ago, but we ended up leaving for Thanksgiving earlier than I expected, so I wasn’t able to post. So instead of 3 weeks of Wreck-it Ralph, you get one big week and a smaller week! This is great for Christmas time because there are so many sweets, you won’t even know what to do. We aren’t going to make ALL the candies shown in the movie, because that would take a blog unto itself. Plus, most candies shown are most commonly store-bought. But we do have some great recipes for you from Disney’s Wreck it Ralph! At the beginning part of the movie, the characters from Fix it Felix through an anniversary party. 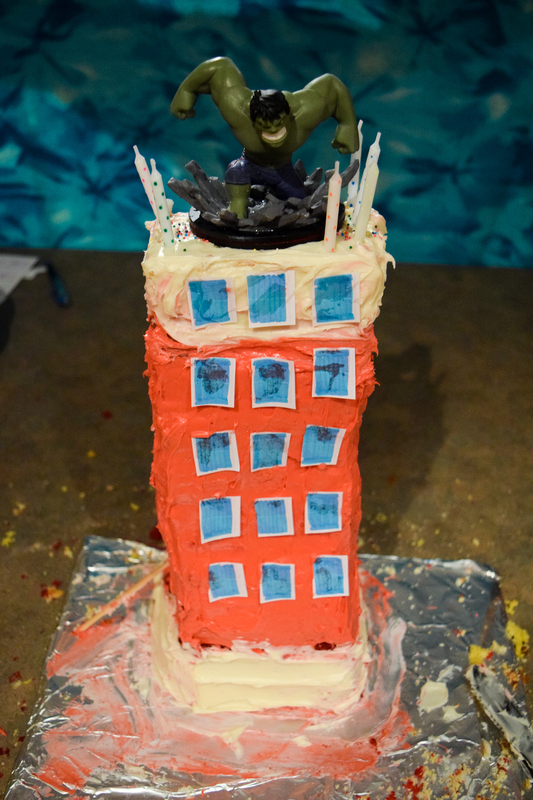 One of them bakes a cake that’s a replica of the building they live in. She even goes through and names all the cake flavors, Red Velvet, Lemon, Rum and Vanilla. She doesn’t get to the vanilla, but it is mentioned in a Wreck it Ralph children’s book. So we got to make all of these cakes! The rum was the best, followed by the lemon. Preheat the oven to 350 degrees F. Lightly oil and flour 1 9x13 cake pan. In a large bowl, sift together the flour, sugar, baking soda, salt, and cocoa powder. In another large bowl, whisk together the oil, buttermilk, eggs, food coloring, vinegar, and vanilla. Using a standing mixer, mix the dry ingredients into the wet ingredients until just combined and a smooth batter is formed. Pour the batter in the cake pan. Place the pan in the oven evenly spaced apart. Bake until the cake pulls away from the side of the pans, and a toothpick inserted in the center of the cakes comes out clean, about 30 minutes. Remove the cake from the oven and run a knife around the edges to loosen them from the sides of the pans. Invert the cake onto a plate and then re-invert it onto a cooling rack, rounded-sides up. Let cool completely. Preheat the oven to 350 degrees F. Grease and flour 1 9x13 pan. You may also line the bottom with parchment paper, if desired. Cream the butter and 2 cups granulated sugar in the bowl of an electric mixer fitted with the paddle attachment, until light and fluffy, about 5 minutes. With the mixer on medium speed, add the eggs, 1 at a time, and the lemon zest. Sift together the flour, baking powder, baking soda, and salt in a bowl. In another bowl, combine 1/4 cup lemon juice, the buttermilk, and vanilla. Add the flour and buttermilk mixtures alternately to the batter, beginning and ending with the flour. Pour batter in pan, and bake for 45 minutes to 1 hour, until a cake tester comes out clean. When the cake is done, allow to cool for 10 minutes. Remove the cake from the pan and set it on a rack set over a tray or sheet pan. Preheat oven to 325 degrees F (165 degrees C). Grease and flour a 9x13 pan. In a large bowl, combine cake mix and pudding mix. Mix in the eggs, 1/2 cup water, oil and 1/2 cup rum. Pour batter in the pan. Bake in the preheated oven for 60 minutes, or until a toothpick inserted into the cake comes out clean. Let sit for 10 minutes in the pan, then turn out onto serving plate. Preheat the oven to 350 degrees F. Butter the bottoms and sides of a 9x13 cake pan; dust with flour, and tap out the excess. Whisk together the flour, baking powder and salt in a medium bowl; set aside. Beat the butter, sugar and oil in a large bowl with an electric mixer on medium-high speed until light in color and fluffy, about 5 minutes. Beat in the eggs, one at a time, and then the vanilla until combined. Alternate folding the flour mixture and the milk into the batter with a spatula, adding the flour in three additions and the milk in two, starting and ending with the flour, until just smooth. Pour into pan. Bake the cake on the same oven rack until golden on top and the centers spring back to the touch, 35 to 40 minutes. Let cool in the pan about 10 minutes, then turn out onto cooling rack and let cool completely. There are some chocolaty peaks around Sugar Rush. They could be a number of things, but since we had a plethora of cake, we decided to make some yummy cake balls! Dump a whole container of frosting into a bowl with cake. Chill the balls for 30+ minutes. Dip the cake balls into the chocolate, place on a baking sheet with parchment paper. Chill the balls until the chocolate hardens. When Ralph and Vanellope are running away from King Candy, they are driving on a ground that looks a lot like chocolate caramel swirl fudge. Prepare an 8" X 8" glass or non-stick baking pan. Place foil inside and butter the foil. Melt the mixture and continue to stir until completely mixed. Set caramel sauce aside for now. In a 2 quart saucepan combine the sugar, 2/3 cup evaporated milk, marshmallows, butter and salt. Stirring constantly over medium/high heat bring to a boil and continue to boil for an additional 5 minutes (this is important, do not boil for more than 5 minutes or less than 4). Remove from heat and add in the vanilla and chocolate. Stir until the chocolate is melted and the mixture is completely combined. Pour mixture into prepared pan, bang pan gently on table to remove any large air bubbles. Pour the caramel mixture over the top of the fudge. Using a knife swirl the caramel into the fudge. Allow the fudge to come to room temperature. Now place the pan in the refrigerator for 30 minutes to set the fudge. Remove the pan from the fridge, using the foil ends carefully remove the fudge from the pan. While the fudge is still cold use a large sharp knife to cut it into desired portions. Store leftover fudge in an airtight container in a cool dark place. Inside of Vanellope’s cave, it is made from tons of Peanut Brittle. I had to be really careful making this because my wife is severely allergic to peanuts. I only got to try a little before giving the rest away. Grease a large cookie sheet. Set aside. In a heavy 2 quart saucepan, over medium heat, bring to a boil sugar, corn syrup, salt, and water. Stir until sugar is dissolved. Stir in peanuts. Set candy thermometer in place, and continue cooking. Stir frequently until temperature reaches 300 degrees F (150 degrees C), or until a small amount of mixture dropped into very cold water separates into hard and brittle threads. Remove from heat; immediately stir in butter and baking soda; pour at once onto cookie sheet. 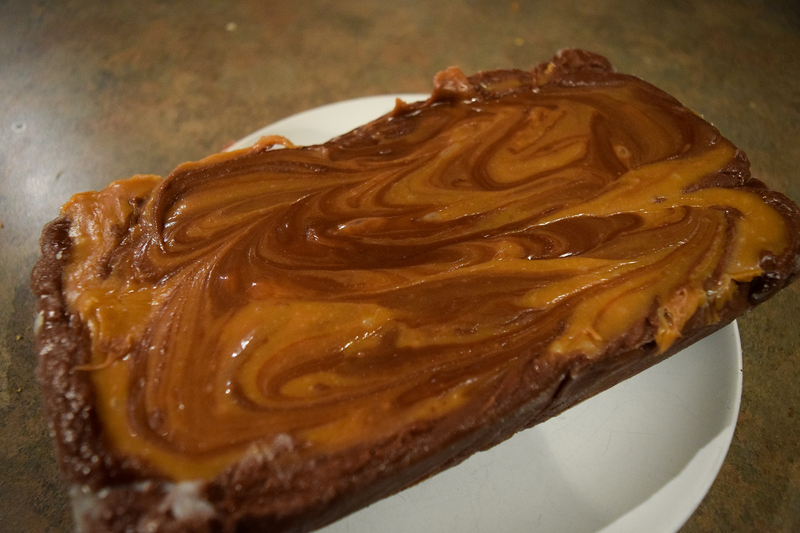 With 2 forks, lift and pull peanut mixture into rectangle about 14x12 inches; cool. Snap candy into pieces. Felix uses the Laffy Taffy to rescue himself and Calhoun from the Nesquik sand. Butter 2 large baking sheets, and set them aside. In a medium saucepan, stir together the sugar and cornstarch. Add corn syrup, water, butter and salt, and stir to blend. Bring to a boil over medium heat, and cook until the mixture reads 250 degrees F (120 degrees C) on a candy thermometer. Remove from heat, and immediately stir in the drink mix powder. Quickly pour out onto the prepared baking sheets, and let stand until cool enough to handle. Grab a few helpers, and butter everyone's hands. Stretch (pull) the taffy until it lightens in color, and becomes firm. Roll into bite size pieces, and wrap in small squares of waxed paper. Will it Give you the Honey Glow Somethin’ Awful? All the food was great and super sugary. Even the liquid taffy was tasty, but very sweet. We loved the fudge and the cakes. Wow. That tower cake looks impressive! That must have taken you a long time!